Sorry, you can only order up to 799 units of this product! Not everyone is fortunate enough to have a large family bathroom suite; the majority of people could really do with a little bit more space in what is usually the smallest room of our homes. Corner toilets are the ideal way of achieving extra room as they fit snugly into the corner with minimal protrusion. 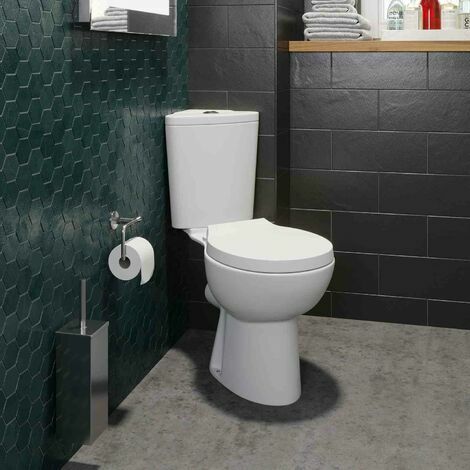 The Forli close coupled toilet by Ceramica is a gorgeous space saving corner toilet. It's made from ceramic using the highest quality manufacturing techniques and finished in a crisp, neutral white. Supplied with a matching white soft close seat so accidentally dropping it won't wake the entire house. Fitted into the cistern lid is the stylish chrome push button. Studies have found an average reduction of 27% in the volume of water used in a dual flush cistern, not only will it save you money on your water bills but it's CE and WRAS approved. Covered by a brilliant 10 year guarantee on the ceramic and a 2 year guarantee on the seat so you'll have peace of mind and reliability for years to come. High quality ceramic finished in a contemporary white. Soft close seat to alleviate any worries of trapping fingers. Particularly good if there are young children in the household. Compact close coupled design to fit in a corner and save space. Dual flush cistern to save you money on your water bills. CE Approved with WRAS approved cistern internals. Chrome push button sits atop the cistern for that added modern styling. 10 year guarantee on the ceramic and a 2 year guarantee on the toilet seat.